For the most part of my life, I did not understand how Twitter worked. I remember when I was in middle school, someone told me, Twitter is just like Orkut and I created an account. I logged into Twitter for the first time and I had no idea what I was supposed to do. What was I supposed to “Tweet”. I followed some Bollywood celebrities. I had no idea why they were tweeting what they were tweeting. The entire twitterverse was moving too fast for me. 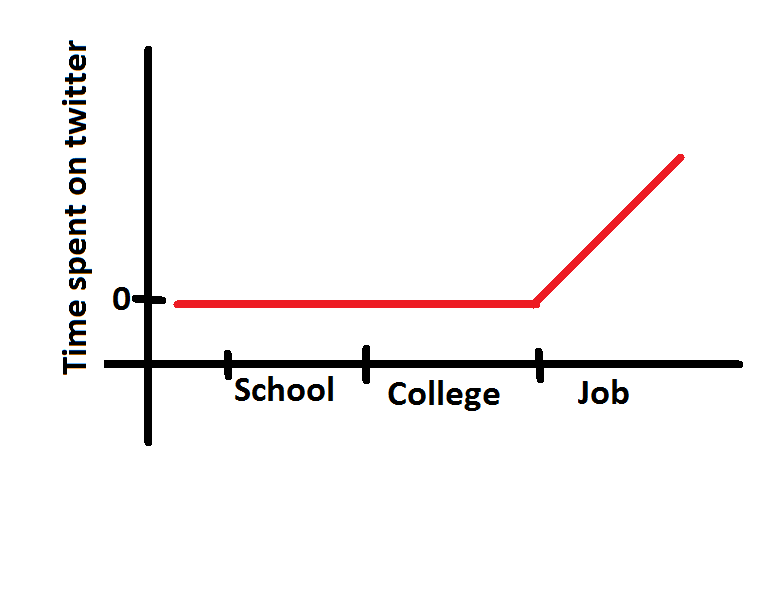 I had similar experience few times during college but as I started my job, I started using twitter. I cannot think of a concrete reason for this but I guess the outer world started mattering more to me and twitterverse became my window to this larger world. Here are few things that I love about Twitter. It is Fast. The speed at which a hashtag is formed or something is retweeted is astonishing. No other social media come even close. Bragging potential of Twitter is low. You don’t post photos of your food or your latest trip to Manali on Twitter. I read somewhere on the internet that ideal Social media post should be either entertaining, informative or both, and nothing else. In case of Twitter, those are the only option you have. People are more human on Twitter. Since you cannot brag on twitter you have to tweet your actual opinions and news. So, What do I share on twitter? Rebel 1: let's vandalize railways and send our message. Rebel 2: what is our message? Rebel 1: we do not confirm to any specific ideology, people should make whatever they want from our message. 2. My comments on the things around the world. 3. Rants about some services and companies. 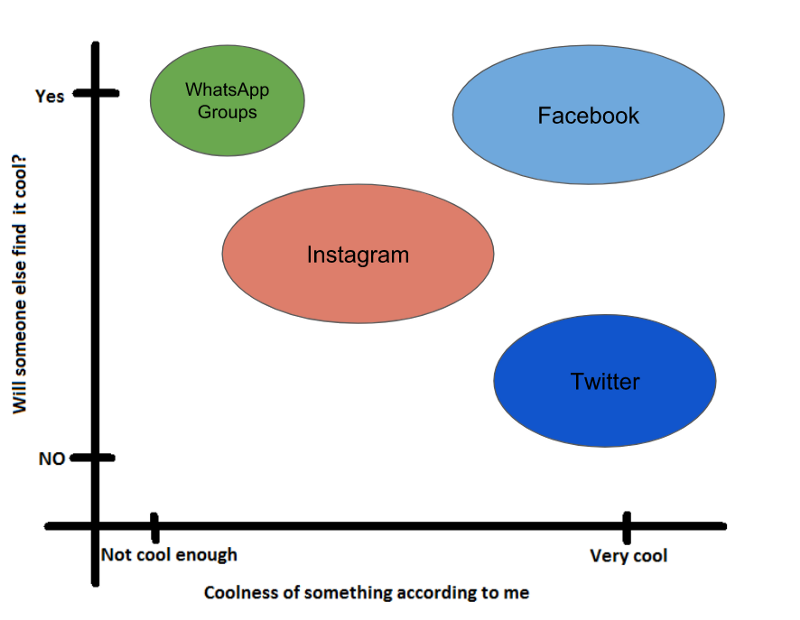 I can summarize the above and my other social networking behavior in the chart below. The learning curve. Twitter is not the most welcoming of new users. It certainly is an acquired taste for most users. The UI is could be better. I might have this opinion just because I am so used to the Facebook UI, but I think the way comments and threads are represented could be better. Tweets cannot be edited. It is 2018, we have self-driving cars, We can unlock phones by just looking at them, we have fully decentralized currencies But, we cannot edit tweets. This is not a problem for me (as I don’t really have any followers) but is a problem for the famous people because of whom most people use twitter. Obviously, Twitter is not for everyone. It will certainly not have the level of success the facebooks and Instagrams (read, braggable social media) have but, Twitter is certainly an essential part of my Internet life now.